Whatever type of engine your boat has, outboard, inboard, stern drive, I/O, or V-drive, it will most likely have a water pump to keep the engine, radiator, and exhaust running cool. Unlike cars which use anti-freeze, a boat draws water to cool the engine directly from the body of water it is floating in. Over time, this action can tax a boat water pump, specifically its impeller component, causing it to crack. 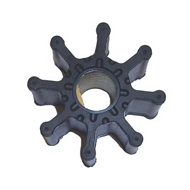 This is because water pumps use rubber impellers with vanes to draw water to the engine, and prolonged exposure to heat degrades rubber. While many impeller manufacturers state that an impeller will last up to three years, Wholesale Marine recommends having the boat water pump’s impeller replaced as part of your boat’s annual maintenance. A replacement water pump impeller is very inexpensive, and having to replace a seized engine, well, not so much. Browse Our Selection of Boat Water Pumps and Impellers! Wholesale Marine truly carries everything boaters need to keep their craft running smoothly. 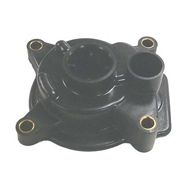 We have an extensive inventory of boat water pumps and impellers to fit all the major manufacturers including Chris-Craft, Chrysler, Crusader Engines, Evinrude, Force Outboards, Honda Marine, Johnson, MerCruiser, Mercury, Mariner Outboards, OMC, PleasureCraft Engine Group, Suzuki, Tohatsu Outboards, Volvo Penta, and Yamaha, as well as impeller replacement kits by Sierra. Not sure what part you require? You can speak with one of our knowledgeable staff and be certain you’ll buy just what you need. If your boat requires a new water pump, or if it is time to replace the impeller, Wholesale Marine has you covered. We stock everything boaters require to keep their vessels well-maintained and ready for their next voyage. Once you become a Wholesale Marine customer, our selection, experience, and renowned customer service will keep you coming back. When you require anything for your boat, give us a call. For same day, flat-rate shipping and our low price guarantee, call us at (877) 388-2628. Be sure to ask about our Captain’s Loyalty program for additional discounts every time you shop at Wholesale Marine.